The state of West Virginia has partnered with game publisher Konami to bring Dance Dance Revolution (DDR) into hundreds of school physical education (PE) programs. The deal will roll out over 700 DDR arcade machines, beginning with the state\'s 103 middle/junior high schools. DDR will form a significant component in West Virginia\'s PE classes, and the effectiveness of the program will be monitored by the West Virginia Public Employees Insurance Agency (PEIA) and the West Virginia University\'s (WVU) Motor Development Center. The students participating in DDR-oriented physical education will be monitored, and the resulting data will be studied to chart the changes resulting from the DDR workout regimen. A thorough study of the data should result in the first fact-based conclusions about the usefulness of games as forms of exercise and the issues involved in bringing game-oriented curricula into the academic setting. Representatives of PEIA, WVU\'s Motor Development Center, the West Virginia Department of Education, Mountain State Blue Cross Blue Shield and Konami shall oversee the project. The state will share the results of this study with Konami and publish the results of the study in reputable professional journals. 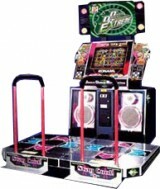 DDR has been a massive success since it first hit North America in 2001. It has consistently been one of the most popular contemporary arcade games, and it supports a lively fanbase who hold tournaments and choreograph special DDR routines for competition and performance. Many stories have been filed on individual gamers using DDR to augment, or even as the mainstay, in a workout routine. There are also several other schools in the US that have individually opted to adopt DDR into a physical education curriculum. West Virginia\'s announcement is the first statewide, sweeping adoption of videogames into physical education, and the accompanying research makes it an interesting case for other states and organizations considering such changes. Nidia Henderson, Wellness Director of PEIA, said, \"Addressing childhood obesity is among the top priorities of Governor Manchin\'s administration.\"
Konami\'s DDR was chosen because of its popularity and its relatively low price: DDR is available on a number of platforms, and given the high cost of much workout equipment, arcade machines are not unreasonable alternatives. Clara Gilbert, Director of Business Partnerships, Konami Digital Entertainment, Inc. said, \"DDR has been a proven success in schools and this program with the State of West Virginia demonstrates the positive effects that can come from making DDR a part of one\'s daily routine. This first-of-its-kind partnership will help us continue to demonstrate the benefits of DDR to consumers around the country.\"
Gilbert also makes this mildly worrying statement: \"Bringing the health benefits and enjoyment that DDR provides to school children is a great way to combat childhood obesity that is caused by the sedentary lifestyle of today\'s kids.\"
It is a good move to update an aging curriculum, but it\'s disturbing to see such a gesture undercut by commentary about \"the sedentary lifestyle of today\'s kids.\" Games have typically been designed with little to no physical effort required. It is a natural quality of abstracting the game world to machines that are designed within numerous technological and cultural constraints. Because of the popularity of games, and ever-rising rates of television viewing and web browsing, \"today\'s kids\" get a bad wrap. Henderson calls the DDR adoption \"a unique opportunity to turn \'screen time\' into active time,\" which implies that \'screen time\' is somehow inherently inactive. However, I think many gamers would claim that the dynamics of traditional outdoors sports and activities are simply not as stimulating as the intellectual and emotional rush of gaming. Many gamers are excited by efforts to grow a branch of gaming that incorporates more active gameplay mechanics. DDR has been proof of that, as well as Sony\'s EyeToy and the buzz surrounding Nintendo\'s Revolution controller. The Boktai series on Game Boy Advance is a great example of innovative gameplay that requires users to play in sunlight, thereby making the act of playing more connected to the real world. Screen time is active time, so active that it easily usurps all of our other activities and demands our full attention. Integrating a game like DDR into the school curriculum is not about combatting the lifestyle of today\'s kids-- it\'s about accepting it and working with it rather than against it. DDR is a wonderful physical activity, and it can teach players a lot about rhythm and coordination (easily as much as I ever learned playing volleyball or running laps). Physical education (PE) is one of the most iconic examples of old-school pedagogy: The whistle-blowing coach insisting on arbitrary sets of calisthenics or instructing grade-schoolers in games they\'ll never actually play (because they require a dozen small playground balls, orange rubber cones and 22 players). For a long time, the solution to old ideas about physical activity has been to simply remove PE from the school day. Unfortunately, that simply creates people who never develop a love for, or even base enjoyment of, exertion. The DDR announcement is a step in the right direction. Much more can and will be done to integrate more appropriate physical activities into our schools, but this is an excellent starting point. Congratulations to West Virginia on its progressive thinking, even if the reasoning behind it is a little bit warped.